Tonight our children and any other families who don’t mind venturing out into the country, will be coming by for treats and to enjoy caramel corn and other snacks. This morning I started popping the corn. I made 2 of the following recipe. Besides I made some with butter and salt; for anyone not wanting the sweet caramel. Below I did a carb count just to see how many carbs are in one small sandwich bag of the caramel corn. In prior years I would use less popped corn so the result was sweeter. 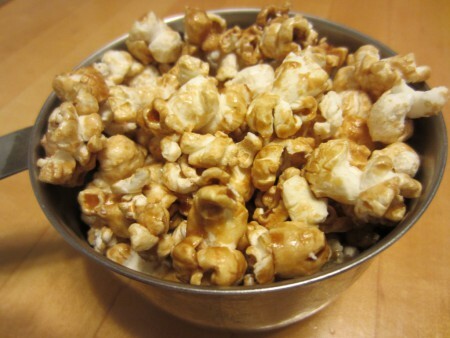 This year I decided to use more popped corn (as in the recipe below) just because we are trying to cut back on sugar and syrup. It still turned out very tasty. Boil the above for 5 minutes. Pour over popped corn, stirring well to cover as well as possible. Spread into baking pans or roasters and bake at 250 ° F for 30 minutes. Stir every 10 minutes. Remove from oven and separate kernels as you dump this into flat pans to cool. Once they are cool, they will not stick together. I measured the finished caramel corn of one batch and had 30 packages with 2 cups in each. The brown sugar, corn syrup, and butter in each small sandwich bag had 30 grams of carbs.